The 2019 edition of Co-operative Congress is being held at the Chateau Laurier Hotel in beautiful Quebec City. This year, Congress will feature a full day of tours to co-operatives in and around the old city on June 18 followed by a welcome reception that evening in the Cour intérieure (patio) of the Hotel. The conference begins on June 19 with a plenary session in the main ballroom of the Chateau Laurier with special guest speakers and keynote presentations until noon. Six breakout sessions are planned for that afternoon in more interactive settings. The evening of June 19 will feature our annual awards ceremony celebrating the Co-operative(s) of the Year, the Emerging Co-operator Award, and our most prestigious personal award for careers of distinction, The Achievement Award. The awards will be presented during the gala dinner. 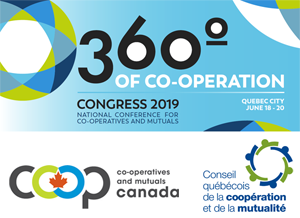 The 2019 conference theme is 360° of Co-operation! It represents our collective co-operative perspectives from all economic sectors and types of co-operatives, large and small, rural and urban, financial and non-financial. We will be gathering from June 18-20 in Quebec City to advance our common objective of a human centred economy through co-operation.